To book special group tours: Cod tours are self-guided. For group tours/rates of 10 or more, please contact codkeeper@yahoo.com to book tours (guide may be available). Please do not use any other address including the 1089 E 9th St., or North Marginal Rd. addresses! They no longer exist and are not recognized by the USPS. The USS COD Submarine Memorial is a National Historic Landmark and is docked in Cleveland, Ohio. USS Cod Torpedo Run motorcycle rally (sponsored by American Legion Post 562). Cleveland Tall Ships Festival (North Coast Harbor). O19 Rescue Commemoration (coinciding with the Tall Ships Festival). Start time is 2 p.m.
USS Cod 60th Anniversary in Cleveland Celebration. All day event with program at 2 p.m.
USS Grunion Memorial Service. Honor the men of Ohio's WWII lost sub, USS Grunion, lost on this date in 1942. Veterans Fair and Picnic from 11:00 a.m. to 4 p.m.
LAST DAY FOR DAILY TOURS. USS Cod will be open on Saturdays in October and November. HALLOWEEN on a SUBMARINE story program, 7-11 p.m.
Come fly over USS Cod at her North Coast Harbor dock in this incredible video created by Cod Crewman Jon Bradrick on Monday, Sep. 11, 2017. The USS COD Submarine is open for visitors every day -- without exception -- from April 27 through September 30. Our daily hours are 10am - 5pm Eastern time. (1000 - 1700). Please note: In o3er to allow even minimal time to visit the submarine our entrance gate will be closed at 4:30pm (1630). School field trips to COD have been very popular and are encouraged as an educational and entertaining experience for area youngsters. Free parking and discounts from the already nominal admission fees are provided. Please call (216-566-8770), or use the e-mail address below to make arrangements for field trips. During our off-season our telephone is not answered, so please use e-mail to contact us. Our admission prices are: $12 for adults, $10 seniors and veterans, $7 youths (grades K-12). Preschoolers and active duty in military uniform are admitted for free. Come aboard and travel back in time to a place where survival depended upon silence, deep water, and well aimed torpedoes. USS Cod is where Cleveland honors its veterans! COD is docked in Cleveland's North Coast Harbor, on North Marginal Rd., between E. 9th St., and Burke Lakefront Airport, about 1,000 feet east of the Rock and Roll Hall of Fame. Use the East 9th St. exits of Interstates 71, 77, and the Memorial Shoreway. Look for USS COD signs to direct you to our site. A Schematic Diagram of Cod's Torpedo Data Computer has been added to the TDC Restoration page. Click here to see what makes this mechanical marvel "tick". QuickTime VR 3-D images of most of Cod's spaces are now available on this site. Take this link to the QuickTime VR Tour. If you you do not have the free QuickTime player it is available from Apple. We recently acquired two GM Cleveland Model 248 engines that had originally been used aboard another WW-II submarine, USS Stingray SS-186. The two engines will be used for parts for the restoration of Cod's engines. These very large V-16, 1,600 HP diesel engines were originally built right here in Cleveland, Ohio -- the last in 1943. Each engine, with its attached DC electrical generator, weighs about 43,000 pounds (21,000 kG). 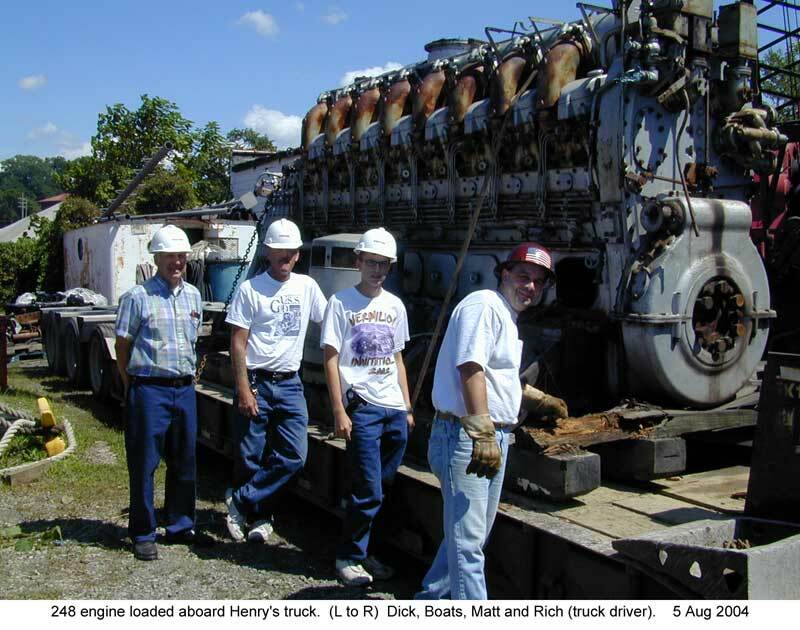 Here is a photo showing one of these engines loaded aboard a transporter. Cod's Mark IV Torpedo Data Computer has been restored to full operation. Click here to see a few photos of this amazing mechanical computer. Help Support The USS COD Submarine Memorial! As a 501 (c) 3 non-profit we accept donations to further the restoration and maintenance of this National Historic Landmark submarine.You can make a check payable to USS COD Submarine Memorial and send it to us at our business address: 5274 Townsend Rd., Richfield, Ohio 44286. We will reply with a thank you letter that will acknowledge your donation for tax purposes.